Apple may be working on a new Belgian store, this time in the city of Bruges, according to claims made on Thursday —though firm evidence of the project has yet to appear. 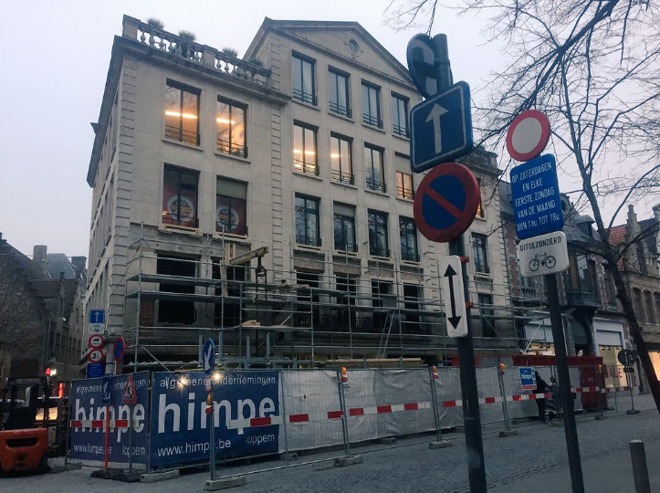 Construction work has already started on a space located at 96 Steenstraat, said iPhon.fr, citing Alexandre Colleau, the founder of Belgium iPhone. On Twitter Colleau shared photos of the building with construction barracades in place, nevertheless suggesting that the store won't open until 2018. Asked by iPhon.fr about the sources of his information, Colleau said only that he considered them reliable, and similar to those that allowed him to successfully predict the current Brussels store before it was made official. MacGeneration noted that Apple doesn't have any job listings for a store in Bruges, and that the location isn't registered to Apple Retail Belgium in business directories. These may not be problems for a store launching in 2018, however —the directory date for the Brussels store is Sept. 19, 2015, the same day it opened. More uncertain is why it would take a full year to open a store. The explanation may be that 96 Steenstraat is a five-story structure, and previously at least was home to several tenants, including three fashion outlets on the ground floor. If Apple intends to make use of most or all of the building, that could entail major renovations, complicated further if the company has to preserve historic architecture. In the past couple of years much of Apple's retail expansion has been international, since the U.S. market is already thoroughly saturated. There have been rumor of new stores in places like Brooklyn and Washington D.C. though, and older stores have been relocating and/or renovating, including the Fifth Avenue flagship in Manhattan.